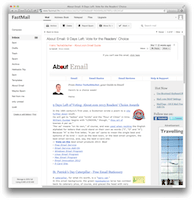 FastMail is a great email service with IMAP access, useful features, and a stellar web interface. We see many good features and also some weaknesses For example, it would be nice to have a tad more storage space with the basic plans. FastMail offers elegant, powerful and flexible web-based access to email. IMAP access is included, too. You can retrieve other email account's mail and send emails from any address. FastMail does not offer labels or smart folders to organize mail. Countless configuration options and things to do present a learning curve. FastMail lacks a calendar and task manager or integration with third-party services. FastMail offers email accounts with 100 MB to 60 GB mailbox size and IMAP access. The fast and highly customizable web interface can compete with many an email program. Keyboard shortcuts make it fast. FastMail makes it easy to write both plain-text and rich HTML emails properly. You can create flexible custom filters and vacation auto-replies in FastMail. FastMail also includes basic protection from spam and viruses. Paid accounts use personal Bayesian filtering. Counteracting phishing attempts, FastMail disables links that can be identified as misleading. You can collect mail from other POP accounts and send messages using their addresses right from FastMail. FastMail includes a fully featured address book as well as file hosting and a notebook (but no calendar). Email services on the web are great, but they often come at a price -- tons of ads crowding a slow-loading and all-around cumbersome interface. Not so with FastMail. FastMail nets you IMAP access from any email program that makes up for the somewhat limited online mailbox size of FastMail accounts. Try FastMail's web-based interface and you'll fall in love with its flexibility and power. Keyboard shortcuts take you everywhere in seconds: to the search box, for example, which turns up just the right emails fast; to the folder list, from which you can select with auto-completion; or to the message editor, which can juggle plain text and HTML expertly. If you like FastMail enough to make it your main email service, you can have it retrieve mail from other mailboxes using POP (unfortunately it does not function as an IMAP client)—and send with the right address in the From: line, too, of course. FastMail's filtering interface may look confusing at first, but it is quite sensible and versatile. Unfortunately, free FastMail accounts do not enjoy the best level of spam and virus filtering. Basic junk dumping is in place, though. While operating FastMail's folders is a pleasure, the freedom of multiple labels per message is lacking. While finding messages with FastMail's search offers swift and precise satisfaction (and search terms can be saved for one-click repetition), smart folders that update in real time and go bold upon new mail would be nice.